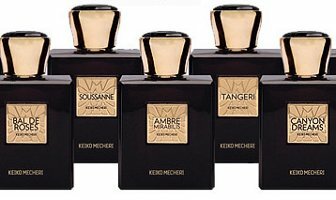 Niche line Keiko Mecheri has launched the Bespoke collection, including seven new fragrances: Ambre Mirabilis, Bal de Roses, Canyon Dreams, Cuir Fauve, Soussanne, Tangeri and Vetiver Velours. Ambre Mirabilis ~ "Intense and compelling, with a heart of burnished amber and an impossible-to-pin-down swirl of salt, sweet and smoke." Bal de Roses ~ "The rose is warm and spice-tinged and can’t quite decide if it’s naughty or nice. This is rose with a past, a rose with secrets that simmer beneath a crystalline briskness that keeps this ladylike enough to meet with royalty." Canyon Dreams ~ "Spicy, smoky, dreamy, peppery – this makes us think of incense and warm skin and lazy days with infinite possibilities." Cuir Fauve ~ "A warm and rakish leather scent with the nonchalant swagger of a swashbuckler. Devastatingly attractive, with a deep and satisfying sweetness under the smoke and spice, this would suit a dashingly handsome musketeer or the roguish young millionaire who’s pretending to be regular guy to win the heart of the sassy shopgirl." Soussanne ~ "A beautiful, dreamy white floral. The opening is waxy and sweet with a soft, billowy puff of powder, then the powder settles and a luminous white blossom opens its petals slowly, drenching the night air." Tangeri ~ "For the impeccably dressed gentleman, or the man who has so much style that whatever he’s wearing seems impeccable, no matter the occasion. Cool and sophisticated and well-pressed." Vetiver Velours ~ "Vetiver gets the velour treatment – hushed and powdery, draped in softness, dusted with a subtle licorice-like sweetness, that highlights the deep and earthy richness underneath." The Keiko Mecheri Bespoke collection fragrances are $275 each for 50 ml Eau de Parfum, and can be pre-ordered now at Luckyscent. A set of all seven in 10 ml sprays is available for $125. Update: see a review of Keiko Mecheri Soussanne. While these all sound nice (and I wouldn’t mind having Soussanne since it’s close to my name), the price is ridiculous. And bespoke? Um, no. item custom-made to the buyer’s specification. Ms. Mecheri, your IQ just dropped by a few points with this release. I’ve given her line a fair shot and disliked every fragrance i tried, so im going to ignore these. The price is way too high for no reason, and the bottle is uglier than her main line. And seven at once? I haven’t smelled them, but the price really is high. A couple of them do sound nice though. Seems like Tom Ford is the new Serge Lutens in terms of influencing the look, tone and strategy of new “exclusive” releases by lux brands. These look like a TF Private Collection bottle and an Armani Prive bottle had septuplets. I do like the fact that they are doing a discovery set. Betcha tons of people are going to buy that discovery set! I’ve never smelled any of these but agree about the Tom Ford look. That discovery set is all I can possibly imagine affording. And even then, I’d have to seriously ponder whether that was a good choice. To buy all 7 bottles of that Bespoke line would be almost $2000. What on earth were they thinking? The Soussanne sounds similar to her Isles Lointaines…. white flowers & almond. There are a couple more that sound similar to her others in her line. I’m disappointed because of the similarities and the new higher price point. I won’t be indulging. Will I sample them? Yes, only if they are at the Scent Bar next time I am up in Los Angeles. * meant to say, only if they are “available” to sniff at the Scent Bar….. Yes, price point with her Bespoke is really high. Even the sample coffret is $125 . 70mls for $125 is not a bad price. The problem is if you don’t like something, you’re stuck with 10mls. If they were to sell in 3-5ml sizes, I’d bet they’d sell themselves. Adding one other peeve about this…. The price point is $275.00 a bottle. So, why can’t we try before we buy with the regular LuckyScent 1.5 ml. individual samples? The sample coffret is $125.00 for all 7 scents for 10 ml. each, but I am not interested in sampling the whole line. That would be a waste of money. I would prefer to buy individual samples. Even ultra niche luxury brand Xerjoff offers individual samples. Amouage too. The Sample Coffret sizes are 10 ml. i which to me is a decant. I personally would not need that much to figure out if the scent is for me or not. The 1.5 ml. sample sizes are perfect for sampling. I am not just picking on the KM line. There are a couple others that do this. I just wanted to get this off my chest. I was surprised due to the higher price point and no individual samples. I must add: when you place an order for any scent at LS, you can request a KM Bespoke sample offered in the 1.5 ml. vials. I’ve really liked the items from her regular line that I’ve tried. I’ll agree that they are not earth-shatteringly creative, but they are quite pleasant. And some days (especially if you’re going in to the office), what you want is pleasant. I’d sniff these if there were a 1-2ml size sample set but I’m not interested in paying the price for 10ml size samplers. This really concerns me with the niche fragrances that the prices and especially those for samples are totally outrageous. I forsee that these niche perfumers are going to price themselves out without having the customer get a chance to sample the goods. I’ve noticed this trend lately and I don’t like what I see for the upcoming future. Sadly, I have not been impressed by any of her scents. Especially in this economy this price point is ridiculous for such lack luster juice. Could the description for Cuir Fauve be any better? I loved most of her scents since I smelled them many years ago. Agree that the price point seems high, but isn’t that the trend? Someone figured out if it’s good enough for handbags and shoes; why not fragrances.